When our son Victor was about three and a half years old, his kindergarten teachers noticed some of the children (aged between three and five years) who had been with him in the centre for about 10 months had started to become curious about Victor’s prosthetic leg. The staff invited me to come and do a talk with Victor about his leg to his classmates. I want to share our experience, how we approached this and our template for the storybook introducing Victor. Firstly, I spoke to Victor about my talk to his peers, so there would be no surprises and he would be comfortable with it. I was clear about my purpose and made sure it was short in duration. I took a bag with Victor’s earlier prostheses in it, and initially kept it out of view. I told the children that when Victor was born, he was a beautiful baby, and that he had one big leg and one little leg. I explained that when he started to walk, he found it was hard to do with one big leg and one little leg, so when he was two years old, the doctors changed the shape of his leg so he could wear a bigger leg on top of his little one. This meant his two legs would be the same size and he would be able to walk more easily. At this stage, I took Victor’s old prosthetic legs out of the bag and showed the children how each prosthesis looked, inside and outside, so they could see that Victor’s leg went inside it. 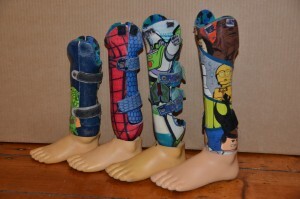 I explained that as Victor grew, his prosthetic leg did not grow, so we had to get a new one. I made a big fuss about Victor being able to choose the pictures he wanted on his legs, and that when he was two he liked Charlie Bear, and then he liked Spiderman, and now he likes Buzz Lightyear. I said that Victor has two Buzz Lightyear toys at home. At this point I had lots of children wanting to tell me about how many Buzz toys they had at home too. They were very excited about the pictures. Prior to the talk I had asked Victor if I could pass around the legs for the children to feel them, and he had agreed, but when I saw the children so excited, I thought that they might become confused and think they could come up and touch Victor’s legs whenever they wanted to. So instead I pointed out, “You wouldn’t like it if someone came up and kept grabbing your legs, would you?” They responded, “No!” I explained that Victor wouldn’t like that either and that his legs were just like their legs – not for other people to touch. Some of the children asked about the next picture Victor would have on his leg, but one boy asked, “When Victor is a man, will he still have a leg like this?” I explained to this intelligent boy that Victor would continue to grow bigger and bigger, but that he would always need a leg like this. The teachers and I felt that the talk went well, but it was clearly stressful for Victor to be the centre of so much attention. He started rubbing his eyes nervously during the last part, so I took him home for lunch while the other children had rest time and he happily returned in the afternoon. This is a story about me and my legs. This is me with my Daddy and me with my Mummy. When I was born, one of my legs was bigger than the other one. It was hard to walk with one leg bigger than the other one, so I got a leg I could put on top of my leg to make it bigger. This is my first leg. This is my Charlie Bear leg. This was my second leg. This one is my Spiderman leg. This is my new leg. This is my Buzz Lightyear leg. I can do everything with my legs. I love running and kicking balls. I love riding my bike. I love jumping and playing with my friends. I have two fantastic legs. I didn’t go into detail about the amputation surgery, as at that age I had not explained to Victor what his surgery had entailed; only that they had changed his leg so he could wear his prosthetic leg, and also, I didn’t want to alarm the children. I made sure the book had no information that Victor didn’t already know, so like our talk to the class, the book would not hold any surprises for him. I created the book in MS Publisher and printed it at Officeworks in colour-on card paper. You could also use MS Word, but it is not quite as easy. There was one complication that arose a couple of months later, when Victor kept crying at the prospect of going to kindergarten. After a few weeks, he confided to me that there was a boy who had been touching his leg repeatedly. I spoke with the teachers about this and discovered that the child was in another room, that he had additional needs and was unlikely to understand requests not to do so by the educators. I also found out from other parents that the boy concerned was autistic. I was relieved it wasn’t one of the children in Victor’s room, and the teachers monitored the situation and it stopped occurring. I was surprised that it had taken weeks for Victor to tell me, and I could see from my questions and his subsequent behaviour, that he has a tendency to try to be brave and to cope by himself without seeking help from his teachers. We have been working on this and trying to get him to seek help from his teachers more. I think the talk and the book has helped Victor clearly communicate about his legs. Since the age of four, I have taught him to use the words ‘prosthetic leg’, and he handles the rare questions he gets by talking to children like they should understand what a prosthetic leg is. My husband Vlad and I decided never to use the word ‘stump’, as we don’t feel comfortable with it. We simply refer to his ‘little leg’ and now his ‘prosthetic leg’, but earlier it was his ‘Buzz Leg’, or whatever the picture was. This year, Victor has expressed on a number of occasions that he wishes he had another foot ‘like this one’ (his own foot), and has noticed that his left knee is small. He is occasionally sad about this, but not for long, and so far, not with great intensity. Wishing other families in our network all the best and I hope our shared experience is useful for some of you.